So I've been holding out on you guys... I have a lot going on right now (all good things! ), one of which is that we're moving! If all goes according to plan, we'll be closing on our new house at the end of this month. Woot! As excited as I am to have a big backyard and a bigger kitchen, that comes with a price - cleaning and packing up our current house - and our lives for the last 9 years. As you might could imagine, this will be no small feat with two small children underfoot. Caroline loves to "help" me pack, which roughly translates to "ooooh look I found my favorite toy! " (some random ball that she hasn't touched for 2 years) and "Can I play with this book of 2000 stickers that you're trying to pack? I promise not to make a mess!" So needless to say, the less I have to pack and take with us, the better. Which brings us to this lasagna. I'm trying to pare down my pantry, fridge, and freezer. The less we have, the less we have to pack or throw away. I always seem to have several boxes of half-empty pasta, so this made the perfect dinner to use those up. I actually did have some partially full boxes of lasagna noodles, but really any small or medium pasta would work well here. 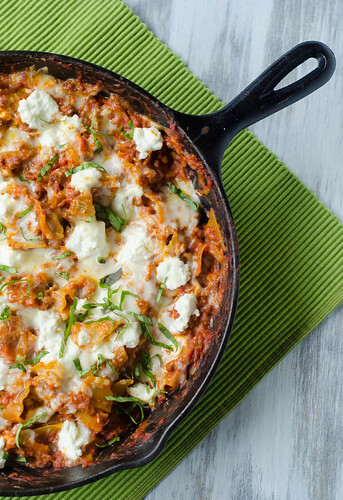 The beauty of this dish is that it really does taste like lasagna, but it comes together in right around half an hour and is completely cooked one skillet. Joey even ventured to say that he likes it better than traditional lasagna. Peeled tomatoes are pulsed in a food processor to form the tomato sauce - but I think you could use crushed tomatoes and still have great results. Onion and ground beef are then sautéed, flavored with some garlic, herbs, and spices, and the noodles and tomato sauce are added. They are simmered on the stovetop, absorbing all the tomato-goodness, leaving you with a super flavorful dish. And THEN, ricotta, parmesan, and mozzarella are stirred in, MORE cheese is sprinkled over the top, and a quick trip under the broiler leaves you with the melty, gooey top that is a necessity to any lasagna. I'll most definitely be making this dish in our new house time and time again. It has quite easily become a family staple. Pulse the tomatoes in a food processor until coarsely ground and no large pieces remain, about 12 pulses. Heat the oil in a 12-inch nonstick skillet over medium heat. Add th onion and 1/2 teaspoon of salt and cook, stirring often, until softened, 5 to 7 minutes. Stir in the garlic, pepper flakes, and Italian seasoning and cook until fragrant, about 30 seconds. Add the ground beef to the skillet. Cook, stirring often and using a wooden spoon to break up the meat, about 3 to 5 minutes, or until it's no longer pink. Scatter the pasta in the skillet, then pour the tomatoes over the top. Stir, increase the heat to medium-high, and cover. Cook at a vigorous simmer, stirring often, until the pasta is tender, 20 minutes (if you don't stir it, the pasta will clump together and stick to the bottom and sides of the skillet). I made something similar from a Cook's Country recipe. You know I love that test kitchen! Looks great. Congrats on the new home and best luck with the move!! This is exciting! :D Great quick and easy recipe. I have to get a cast iron skillet to try it out! Wow, Josie--so much excitement in your life right now! Congratulations! LOVE this recipe. We make it with ground turkey; it's quickly become one of my favorite weeknight meals. Congratulations on the relocation! It's never as easy as you would like it to be, I find, but hopefully all of the cleaning and packing leads you to an awesome new home! Congrats on the move!! That's so exciting. :) I may not be moving any time soon but I can always use an easier version of lasagna! Love. The good news for you is that if you DO have stuff left in your pantry or fridge, it isn't going far, so you can put it in the car and drive it over. I am sad at how much I'll lose when we move at the end of the month. You'll have to come over and grab one of my many bags of flour I have in the freezer. I looove lasagna and haven't had it in so long. With easy recipes like this, why do I even bother with traditional? :) YUM!! First off, congrats on the move! How exciting! 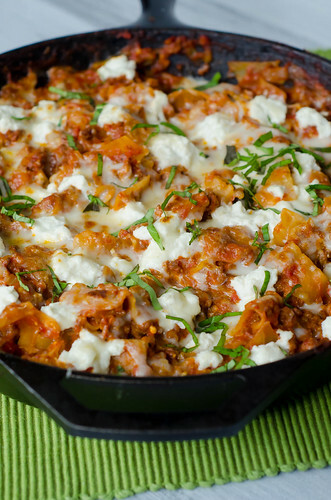 Second, this Skillet Lasagna sounds incredible. This looks great/I love this idea! We at Mr. Food would love for you to submit a similar recipe to The Search for the Ultimate Weeknight Meal, offering a grand-prize to one lucky blogger who will tape a segment to air on national TV! If you're interested, check out our contest page for more details. I've made skillet lasagna before and I absolutely love it. I actually think it has more flavor than layered lasagna. Josie, made this last night and it was delicious! We just moved ourselves and while a huge headache, totally worth it! Congrats on your new place! Just made this tonight and it was fabulous! The perfect weeknight meal - thank you! This has become a regular in our weeknight rotation. I love that it's so easy to fix and even easier to clean up after dinner! Thank you for the recipe! This looks awesome! I love quick and easy! Can't wait to make it! This looks delicious! Do you think it could be made in the crock pot as well? Great recipe! My ultra-picky 4-year old even told me he wants me to make this forever and ever. This sounds delish! I can't wait to try this. For those living in Canada, this was in the What's Cooking Kraft magazine this year. Really yummy and easy, I have to agree. This was incredible! I followed the recipe to a tee and it was perfect!!! Thank you! Made this, but with Italian sausage instead of the ground sirloin (I like the added spice and flavor). So yummy and easy compared to traditional lasagna! Thanks for the recipe! Stephanie, I don't think this particular recipe is very well-suited for fresh pasta. You'd have to adjust the amount of liquid pretty greatly, and adjust the cooking time as well. Okay - thank you! This will still be on my agenda because it looks amazing.